Download SSC JE answer key 2016, Check SSC JE 31.01.2016 answer key exam solution paper solved - Staff Selection Commission (SSC) had conducted Junior Engineer (JE) 2016 exam on new revised date i.e. 31 January 2016. The question paper have various sets / Test forms. Through the answer keys, candidates can estimate their score and qualifying status. The test was held at various centres all over the country. So those candidates who had applied, can download their SSC JE Exam answer key 2016 from the direct links given below. Latest news: SSC JE Answer key had been released on 14 March 2016. Staff Selection Commission Junior Engineer exam was held on 31-01-2016, an open competitive examination for recruitment of Junior Engineers, Group ‘B’ Non-Gazetted posts. The candidates need to possess Degree or Diploma in Civil or Electrical or Mechanical Engineering from an institution recognized by Govt. of India or equivalent qualification in order to apply for these SSC JE posts. Selected candidates will be given pay band of Rs.9300-34800/- plus Grade Pay Rs.4200/-. Candidates can download their SSC JE answer key 2016 for Paper 1 Examination from here after availability. The download links for SSC answer key of Junior Engineer 2016 examination is provided here. 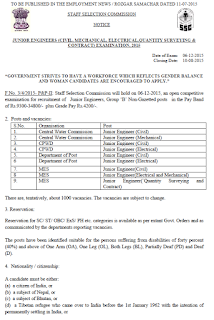 Staff Selection Commission will organize a All India Open Examination for Junior Engineer (Civil & Electrical) posts in Central Public Works Department (CPWD) & Department of Posts, Junior Engineer (E/M) JE (Quantity Surveying & Contract) in Military Engineering Service (MES), JE (C/M) in Central Water Commission (CWC) and Farakka Barrage, JE (C, E,M) in Border Roads Organisation (BRO) in Ministry of Defence. There are a total of 1000 vacancies (tentative) that will be filled through this examination. 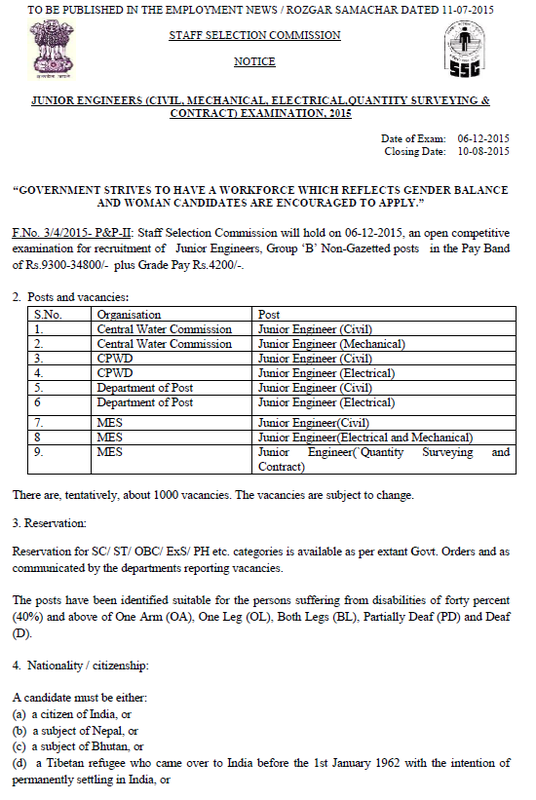 There is no interview for Junior engineer posts as per the revised selection process. The Written Test have 2 papers i.e. one of objective and other descriptive type. Total marks for both the papers is 500 marks. Objective paper answer key can be checked from here after release. Paper-I consist of Objective Type Multiple Choice questions only. There will be negative marking of 0.25 marks for each wrong answer in Paper-I. Candidates who are shortlisted on the basis of performance in JE Paper –I will be called for Paper-II (Conventional Type). Candidates can download their SSC JE answer key from above.